Square Enix has confirmed that Deus Ex: Human Revolution Director's Cut will be making its way to Playstation 3, Xbox 360 and PC, meaning the game will no longer be a Wii U exclusive. Executive game designer Jean Francois Dugas from Eidos Montreal — the developer behind the action title — revealed during GameSpot's E3 2013 Live Show that the game would be going multiplatform. You'd be forgiven for getting that feeling of déjà vu, as we've already seen a similar situation unfold with Rayman Legends, when Ubisoft delayed the title so it could release on other systems. Are you at all surprised by this news, or was it to be expected? On a more positive note, it was previously stated that the Wii U version of Deus Ex would be the "ultimate edition". Nintendo released a new trailer for the game today, which we've included for your viewing pleasure. Well kinda disappointed here that they lost the exclusive but it was to be expected. Are there any third party Wii-U Exclusives other than Zombie-U and Sonic Lost World? So they're giving the other platforms the same game they had for a while now, which the gamers would have paid for, including DLC which they would have paid for also, excluding the ability to use the 'awesome new ways of control by touch', and expect to make money from that? Why would 360, PS3 and PC users want to buy this again? expected. to me it doesnt matter, i was extremely satisfied with what was shown in yesterdays ND. Pikman 3 and Bayonetta 2 are my most anticipated. @ferthepoet Bayonetta 2 and The Wonderful 101. WiiU will still be definitive version, Having the best visuals alongside the PC version but with Added Gamepad functionality. So it's not exclusive, Not many 3rd party published games are exclusive to a single platform. Regardless of what that platform is. No surprise there. Gamers acted like morons when it was announced "hurp durp it's not going to sell, give us something better!". Well there you go, self fulfilling prophecy. It's not going to sell so they put it on platforms that will buy it. @nyallj Well I would have thought that the PC versions would have gotten this a a free update (not including the dlc). @GiftedGimp Well I still say the PC version would be the definitive version because of mods but if its just the developer version then ya the wii u would be the definitive version. It's not really interesting news as long as Wii U gets it. Looking forward to play this series for the first time. @ferthepoet No and there is not likely to be any in the near future either. @dumedum - They still have plenty of time to cancel it or change their minds. Frankly right now nothing that 3rd party developers 'dont do' for the WiiU surprises me. Its when they will do something that will make me step back in shock! My god Nintendo. If you cant even keep your upgraded ports exclusive what hope do you have for third party exclusives? No wonder the Wii U is selling badly when it still doesn't have any killer exclusive games. What's the point in bringing in big name third parties when all they do is make an "Ubisoft Exclusive" of their big game?! Blaming Nintendo isn't going to help. Tell SQUARE-ENIX you want Wii U games, not Nintendo. Not surprised. The Wii U install base is low compared to PS3 or X360. It will still be the ultimate version, just not exclusive. C'mon Squre, bring KH3 to Wii U, you kinda already built a fanbase in Nintendo with the handheld games. Really, nothing major, still the Wii U version is the only that will make you hack through the tablet so the only one with the new stuff in it. In all honesty, what does it matter? You get to play the game, you get to play the best version of that game and you get to play it on the console you own. Yep, it does not matter at all. If everyone can enjoy it, that's great! When I heard this news last night, I was totally unsurprised. I don't think anybody's surprised that a third-party "exclusive" is far from it. What bothers me, though, is that Square-Enix has so little faith that they didn't even wait and see how the WiiU version performed before deeming it "not worth it". It's a self-perpetuating business strategy that only harms the image of third-parties in the eyes of Nintendo fans. ... not that Square have ever gave a damn about Nintendo fans. Disappointed yet not surprised. It's an "ultimate edition" so of course it'd come to other platforms. The biggest surprise is that it's coming to Wii U in the first place. I getting fed up with this sort of news. @Haxonberik It is a bit strange with KHIII seeing as how Microsoft fans don't have any exposure at all to the series whereas Nintendo fans have had exposure to the series (via handhelds). Not to mention that the Xbox line has never sold well in Japan, which makes this even odder. 3rd party developers are kinda stupid now-a-days, but whatever. Most 3rd party games now are barely exclusive to a platform anymore. It seems the two companies to go for this generation on Wii U is Nintendo and WB Last gen it was Nintendo and UbiSoft, but UbiSoft decided to become morons as of late. @ferthepoet There are some Nintendo console exclusives like Scribblenauts Unlimited that's also on the pc. i was thinking of getting that game but now on the other hand i guess i wont..
As usual, it all comes down to first-party stuff. @ferthepoet also, you shouldn't forget about lego city undercover, the very best in the fun lego series imo. Sony is probably laughing right now, because they are getting a new game. Microsoft is probably crying because the xbone is lame. They're probably going to put the Gamepad stuff on Vita and Smartglass. No need to buy the Wii U version then. Or this game at all. I'll wait for the deluxe edition stuff to be $10 on Steam. Ok that's fine but.... when is this released? I have come so close to preordering it due to reasonable price and the fact that it looks amazing! But why on earth do we still not have a release date! SONIC LOST WORLD ON THE PS4, XBOX ONE, AND VITA. SONIC LOST WORLD ON THE PS4, XBOX ONE, AND VITA." I was kind of puzzled by this move. 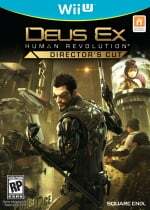 Deus Ex: Human Revolution is a great game and I know they've made some changes to it but the majority who've already played it on PS3, 360 and PC aren't likely to buy this Director's Cut. I knwo I'm saving up newer games coming this fall and I think a lot of others are as well. SE misses another opportunity but it doesn't shock me. This the same stupid company that considers Tomb Raider a fail. It has been poorly managed for years now. Lol! If things go on like this, the only exclusives Nintendo will have are the games they make themselves!! @ex-ps3-junky Pikmin, not pikman. I see this everywhere and it really annoys me. @Gamer83 How are they stupid? Its still coming to the Wii U. The only difference is that it is also coming to the PS3, Xbox 360, and PC. In other words, the gamers on those systems that either missed the game the first time or owned the original version will be able to play this game with out plucking down money for a Wii U. In today's modern gaming business, console exclusives generally don't cut it anymore. It makes more sense from a business standpoint to put the game on as many systems as possible. How are they being stupid? Nobody will buy this unless they haven't already played it. Nobody will pay full price for a patch on machines that already have this software available. Not the least bit surprised. Same thing happened with Ninja Gaiden 3: Razor's Edge. I'm expecting ZombiU to go multi-platform any day now. I thought this was supposed to have been released last month or something... is this why it hasn't come out yet? I think I'll probably end up getting it, but it's just not a day one purchase for me. Not necessarily a bad thing as I see it. Plenty of people have voiced concern here that this could be seen as a re-release of an old game on a Nintendo platform which might suffer lower than expected sales and thus be used as an inaccurate measure for projecting future sales of mature titles. As long as this is marketed equally and releases at the same time the sales figures can at least be fairly compared. It was a good game, I played through on PS3, but I don’t think I'd pay much to play again just for the enhancements available in the director’s cut. Maybe if they included the first Deus Ex as a bonus, I’m playing the PS2 version of the original for the first time at the moment and really enjoying it. Why would someone want to buy this game on PS3 or Xbox 360 for $50-$60 when they can get it now brand new for $20 and buy the dlc for $10. Its a waste of time if u ask me. We should be playing this now on our Wii U's.